OFFROAD CARAVANS TEND to have a certain look about them. Maybe it's the tough checkerplate, extra clearance or funky rims and heavy-duty tyres, but when I see one of these machines go passed I always wonder where the driver's going - or where he's been. The lucky sod. The proportion of local manufacturers dedicated to, or dabbling in, offroad models isn't that large, which is surprising given the number of RVers who like to go bush - and take everything with them. 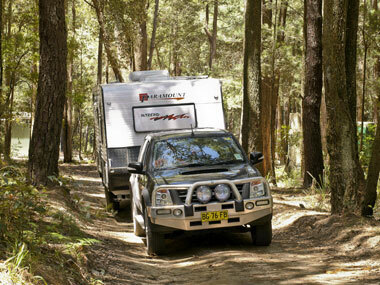 Maybe Australians favour camper trailers when it comes to exploring the unknown. 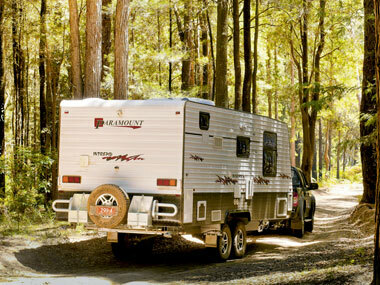 You can haul well-built campers over almost any terrain. 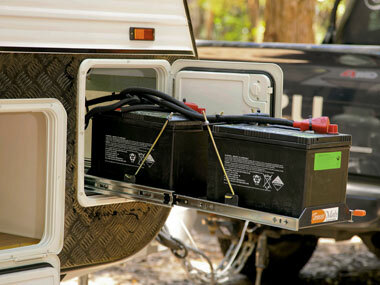 They're smaller and lighter than caravans, and they tow easily. On the other hand, if you prefer five-star luxury everywhere you go, a camper probably won't cut it, thus the need for well-appointed caravans with either rough road or genuine offroad capability. According to Paramount dealer Bob Surdonic, of the Caravan Company in Newcastle, NSW, the new Paramount Intrepid is the real deal when it comes to getting off the bitumen. "It's a genuine offroader with 10in of main-rail chassis, 3.5t capacity, Simplicity independent suspension, offroad tyres and wheels, full insulation. And everything important has been glued, screwed and bolted," he said. After close inspection, I would have to concur with that appraisal, with one important exception: as tough as the Intrepid is, it's not designed to handle deep water crossings. So if water is up to the unsealed door, wait till the level drops before you venture forth. A modular concept, or something approaching it, allows the heavy-duty chassis and offroad suspension to be matched to a number of Paramount models. 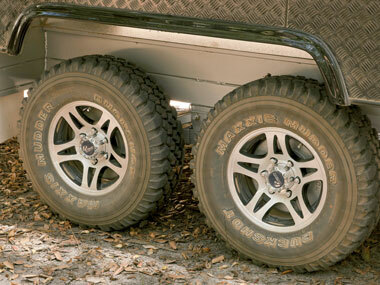 For example, the Tribute, Intrepid, Duet and Classic can all be offroad-equipped. This gives you more choice, which is always a good thing. The 6.56m (21ft 6in) Intrepid model we had on test is also highly optioned. Among the extras you don't get with the standard model are an Anderson plug, twin deep-cycle batteries, reversing camera, solar power, a Wineguard antenna and external speakers. 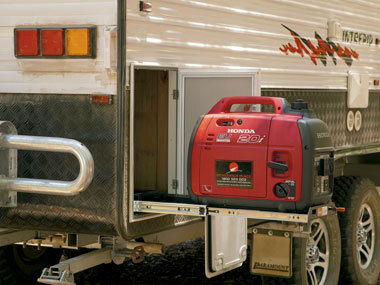 This unit also features a Honda generator in its own offside locker, and a Lemair washing machine in the ensuite. Interior fittings are what you'd expect in a modern caravan, and there is a nice combination of decorative light and shade. Interior and exterior lighting is LED, but it's worth noting that the bulbs can't be changed - when one blows you have to replace the entire fitting. The double bed lifts to reveal copious, compartmentalised storage, which is augmented by bedside tables, three overhead and two vertical lockers, each with a large mirror to reflect your glorious magnificence. 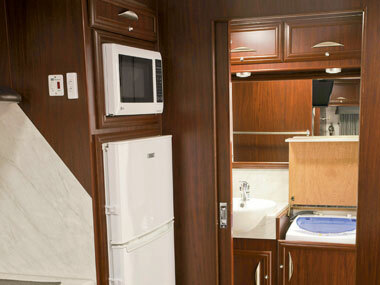 Cabin temperature is controlled by an Aircommand Ibis air-conditioner, plus two Four Seasons hatches and four windows. In terms of entertainment, a Kenwood DVD/CD/MP3 player will burst into life if you feel like some tunes. 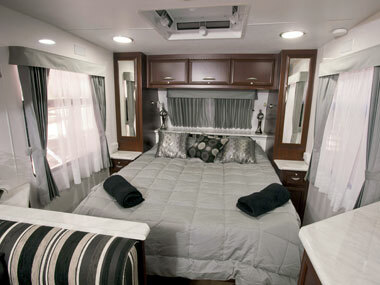 And the Axis flatscreen TV can be mounted on a swivel above the bed, where it can be seen from the bedroom or the tri-fold dinette, or on an exterior bracket under the nearside awning. The white, rolled Laminex benchtops and white splashback add a touch of class to the kitchen and help accent the dark ply lockers and trim. All drawers are on rollers and anything that has to be lifted or raised is on piano hinges. It's all very civilised. The cooking setup is a rather posh four-burner Thetford stove with a grill underneath. Three large lockers are positioned over the food prep area, another two below the sink and two large drawers under the grill. Next to the stove is a large 220L Waeco fridge with an LG microwave above. With external and internal showers and a cassette toilet, this van needs plenty of water, and that's provided by dual 100L tanks. The gauges for these tanks are mounted on the wall near the television. You also get a 200W solar panel with this model, along with the electronic weaponry to regulate it. Things are equally impressive on the outside. The aluminium-clad body sits on a meranti timber frame and, as Bob Surdonic pointed out, the offroad version has additional timber in the walls for more strength, while dust and water sealing has also been beefed up. The lower third of the body is covered in protective checkerplate on the sides, front and rear. This adds weight to the spec, but is necessary on a vehicle being towed on rough roads where gravel and debris are constantly in collision with the body. And by the way, the Tare is 2320kg while ball weight is about 180kg, considerably less than the so-called 10 per cent rule, due mainly to the axles being set midway along the chassis. 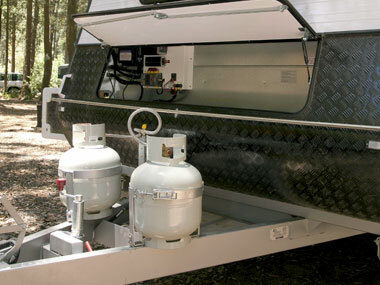 The drawbar is home to two 9kg gas bottles and attaches itself to the tow vehicle with a hefty-looking Hyland coupling. The Simplicity suspension uses rocker-roller leafsprings rather than coils and supports tandem axles running 15in mag wheels and steel-belted radials. Up front, you get a tunnel boot with access on both sides. A hatch on the offside, which opens into the front storage bin, houses dual batteries sitting on slide-out rails, while electronics for this setup are mounted in an accessible spot inside the storage bin itself. 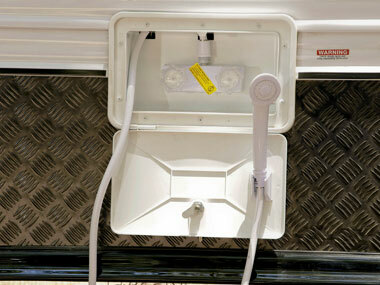 The rear of the van is fitted with a bar supporting a single spare and two jerry can holders. Access to the Thetford toilet cassette is on the offside, between an external shower fitting and a dedicated locker for the Honda generator. What marks the Paramount Intrepid as an interesting van is that it comes from a major manufacturer at a time when relatively few would risk investing in the equipment needed to turn a bitumen-road model into a real offroad performer. The Intrepid has all the creature comforts you could ask for, plus plenty of fresh water capacity, making it well set-up for extended touring. 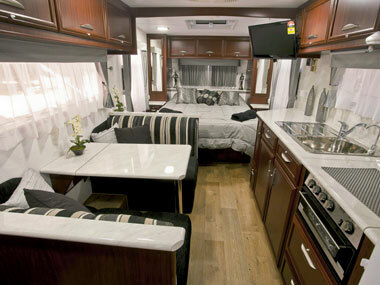 It isn't the toughest offroad model out there, but it's certainly worth investigating if you like the way Paramount builds a caravan for everyone. 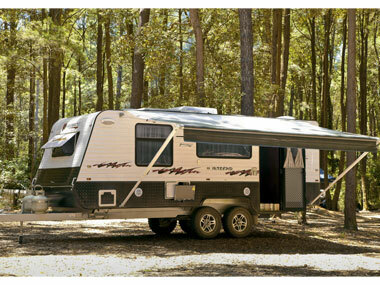 Supplied by: The Caravan Company, 239A Old Maitland Road, Hexham, NSW 2322, (02) 4964 8313, www.thecaravancompany.com.au. WORDS AND PICS Barry Ashenhurst.